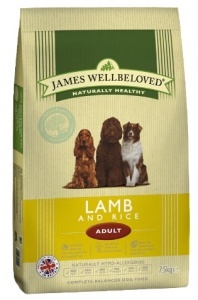 James Wellbeloved Lamb and Rice dog food contains none of the ingredients that cause most food allergies (i.e. no beef wheat or dairy products). Hypo-allergenic to soothe skin irritations. Better digestibility means less stool. Activity-balanced proteins to help calm hyperactive behaviour. Delicious lamb gravy with the taste that dogs love. Regular feeding with lamb and rice has always been the traditional way to calm a dog's digestion and help avoid allergic skin irritation. 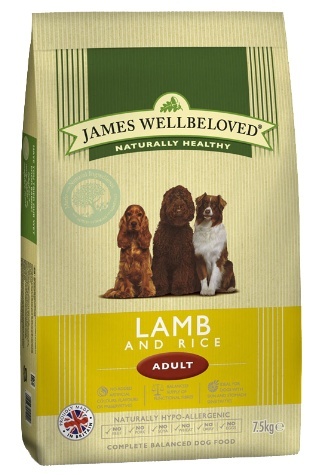 James Wellbeloved dog food is a pure natural complete dry food of succulent fresh lamb and brown rice with the nourishment of barley and the health benefits of seaweed alfalfa and yucca. All smothered in our own delicious lamb gravy.